Head to South Beach this spring. 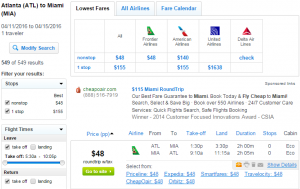 Nonstop flights from Atlanta to Miami have dropped by $100. Book a flight on Frontier Airlines for $38-$48 roundtrip, including tax, when departing this April. Note: While Frontier Airlines itineraries are available on Fly.com, Frontier is currently not sharing the lowest airfare pricing with many independent websites — including Fly.com. 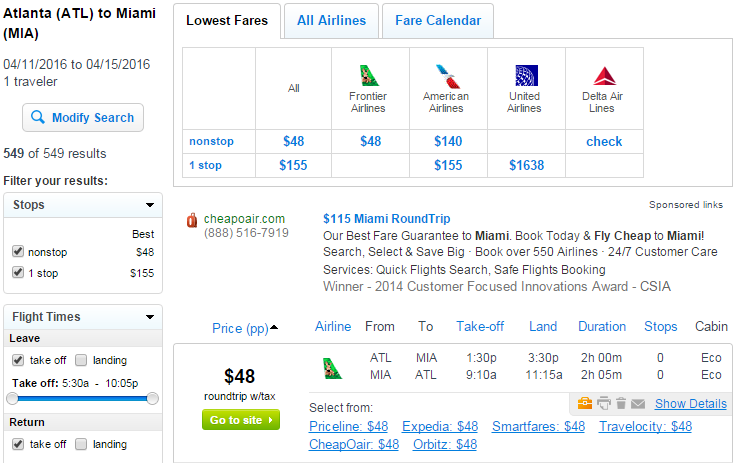 To book this route for $38 roundtrip, including tax. Book directly on Frontier. Frontier charges $25-$60 for the first checked bag depending on when fee is paid. Check our baggage fee chart for more information. From what I can tell, the cheap airfair is when you’re a member of Frontier’s “Deal Den” club ($49.99/yr).